We've got a number of two- to four-year olds, gentle broke, with 30-90 days on them. It's taken us a few years to get to the place where we can offer a variety of started horses, but we're real pleased with the way these are turning out. They have good minds, have been willing learners, and have come along very quickly. These horses have excellent potential and a nice solid start to take them in any direction. 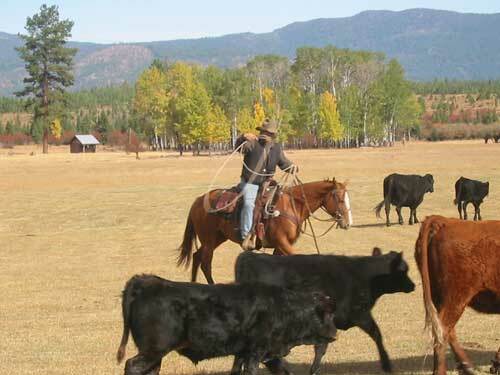 Those of you running dude ranches and in search of good horses to add to your string after letting your wranglers ride them for awhile may also find some good prospects here. Also, a few of these horses would be good starter horses for an intermediate youth or lady, beginner, or 4-H'er looking to spend some time further training a young horse. Horses by Freckles Candoo, or out of his daughters, have a reputation for being fast learners and easygoing--the perfect combination for the conscientious horse-lover new to training. Many of our Blue bred horses are out of Freckles daughters and have also been training up well although they tend to have a little more size to them. All of our horses are priced reasonably, but we'll consider any and all offers. ATTENTION 4-H'ers--If you're looking for a good deal on a really nice quarter horse (primarily yearlings and two-year olds), give us a call. We're more than happy to work with you to find a great prospect at a very reasonable price. We have lots to choose from! Blue Billy Olena is a May 2005 gelding out of Billy Lu Owee by Hancocks Blue Olena. He's a true blue roan with a tiny white star and a whole lot of handsome. "Billy" made good progress as a two-year old and even more this summer. He has 60 days training. 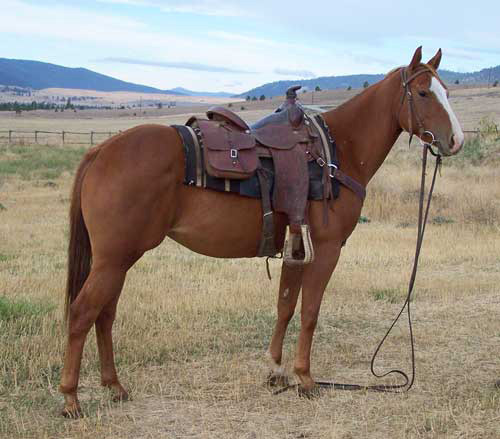 Billy is a little more horse than some, but should be excellent as a roping prospect or performance horse. He trims, loads and hauls and currently stands about 15 hands. SOLD Lenas Doc Au Lait is an April 2005 cremello mare out of Lenas Porcelain Doll by Lucky Jessie Doc. 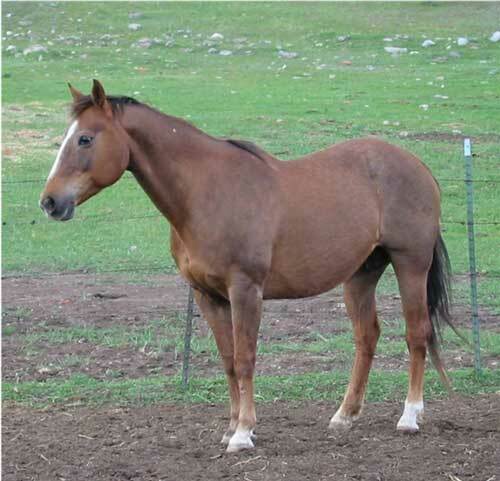 Doc Au Lait has 60+ days training and would make a good barrel horse, O-Mok-See or broodmare. She has a nice pedigree with Doc O'Lena and Doc's Prescription on her papers and has excellent conformation. As anyone breeding for color knows, a cremello cannot produce red (bay or sorrel) so is especially desirable as breeding stock. She is smart, sensible and quick. In 2010, Kelly began using Doc Au Lait as a barrel horse and they have been doing very well together. This mare learns fast and performs well. Babes Bueno Jessie is a June 2004 sorrel mare out of Babes Freckles Poco by Lucky Jessie Doc. "BB" is a pretty-headed filly with speed, agility, and a willing attitude. She has over 80 days training and would be a great barrel or jumping prospect. She's been used to chase cows on several occasions, willingly goes through trees and underbrush, and has been roped off of as well. With her eagerness to please and her sweet disposition, this is one of the trainer's favorite horses, and she's got a nice pedigree to boot with Doc's Prescription on her papers, and Poco Bueno and Colonel Freckles just off. She stands about 15.1 hands, trims, loads, hauls, and is current on shots and worming. This is Zoe's horse and she's willing to deal. SOLD Bueno Sienna Candoo is a June 2003 gelding out of Doco Hickory Miss by Freckles Candoo. He's a dark bay and has been Sigurd's main riding horse since 2006. "Doc" has been on a lot of cattle drives and Sigurd has done team sorting and team penning with him as well. This is a real nice horse with a willing disposition. Doc is the horse pictured on the About Us page. We have a lot of young horses that need to be ridden, so Sigurd felt it was time to begin riding another young gelding, although he has mixed feelings about offering Doc for sale. Freckles Doc Candoo is a March 2006 bay gelding out of Aye Jay Freckles by Freckles Candoo. This colt started training in '08, and has been a real pleasure to work with. He doesn't have any buck in him, follows people around like a dog, and is willing and eager to please. This colt should easily reach 15 hands and should be a nice solid mount. He'd be well suited as a performance horse, or stand up to the rigors of ranch work. He's pretty headed, well-muscled, gentle and an all-around winner. His dam has put some nice babies on the ground and "Shadow" is no exception. He has 60+ days on him. San Man Candoo is an April 2006 sorrel colt out of Peppys Two Cute by Freckles Candoo. This is a very nice colt with a quiet disposition, good muscling, nice conformation and a winning attitude. He's got 90+ days and has real potential as a performance horse. Lenas Rose Olena is a June 2006 red roan filly out of Clarks Lena by Hancocks Blue Olena. This is a good looking, well-muscled filly with a lot of style. She's been started. Chickalena Chex is a 1999 bay broodmare out of Chick a Chex by Lenas Sonny Boy. Chickalena has Doc O'Lena, Doc Bar and King Fritz on her papers and has put some nice colts on the ground for us. This mare had a black filly this May. Chickolena has been saddled and ridden a couple of times, so it wouldn't take much to turn this mare into a nice saddle horse. She learns quickly, has a nice temperament and she's easy to handle. 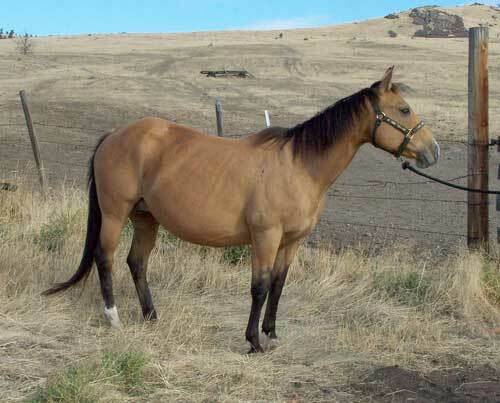 Double C Dusty Lou is a 1990 buckskin broodmare out of Reeds Skippa Liss by Dustin Command. She has King Fritz and Star Duster on her papers. Dusty is easy to handle and foals without complication. Her 2004 bay son by Freckles Candoo sold last year,, and her 2008 buckskin colt by Hancocks Blue Olena sold this summer. Dusty loads, hauls and is current on shots and worming. Very reasonably priced. Aye Jay Freckles is a 1988 sorrel mare out of Docs Double Pal by Aussie Freckles. "AJ" has Doc's Zimfandel and Jewel's Leo Bars on her papers. AJ has had several beautiful foals with nice conformation, pretty heads, plenty of smarts and lots of style. Her 2005 filly (Docs Jewel Candoo) and 2006 bay colt (Freckles Doc Candoo) sell above. She breeds easily, foals without complication, and is a good mother (this year she's mothering an orphan along with her own bay colt). AJ is broke to ride and moves well, but has only been used as a broodmare during the time we have owned her. She is very reasonably priced.